Our history in Phoenix is as colorful as the ancient peoples, immigrants and settlers who shaped it. If you’re a history buff, no trip here is complete without a visit to the museums dedicated to telling Phoenix’s story — places such Pueblo Grande Museum and Archaeological Park and the Heard Museum. For now, though, here’s a lesson in Phoenix History 101: The Hohokam people inhabited what is now Greater Phoenix until about 1450 A.D. They created the first major urban civilization in the Salt River Valley and developed a canal system that’s still in use today. In 1865, the U.S. government established Fort McDowell here, and settlers such as Jack Swilling began farming the land. The city of Phoenix was established in 1868. Two years later, the first survey and census of the city noted it was about a mile long and a half-mile wide, with 74 dwellings and a population of 250. 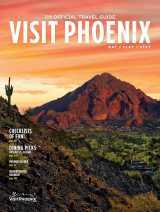 Today, Greater Phoenix covers about 2,000 square miles and has a population of more than 4 million. Learn more about the history of Phoenix at the City of Phoenix&apos;s website.